Cats are some of the most loving creatures on earth, so can be upsetting when a cuddly cat unexpectedly hisses or swats at you or a fellow feline. The good news is that cranky behavior in cats is often is temporary and can be resolved. 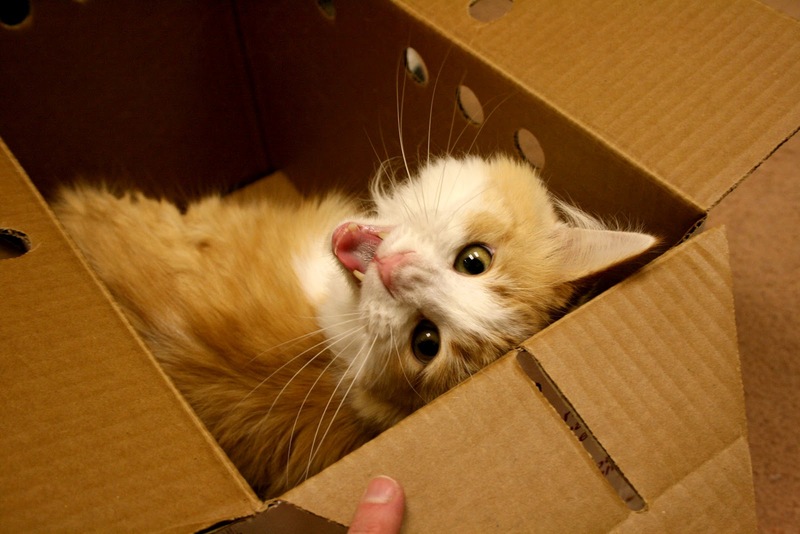 Aggressive behaviors in cats usually stem from some form of stress. For example, a frightened cat may swat in self-defense. But cats also are territorial, so a swatting cat may be defending his favorite chair or his bowl of food. Likewise, cats may exhibit redirected energy. For example, an indoor cat may be watching through a window as a bird hops on the ledge. If you approach the cat while he’s watching the bird, he may swat. Understand that in the cat’s mind, he’s focused on the bird, not you. Perhaps an older cat is jealous of the attention being lavished on a new kitten. He may behave roughly with the kitten. Also, if a cat has a sore spot on his back, he may become grouchy with anyone who touches it. This is normal for any pet—and even people! So what should a caring cat owner do? If a docile cat suddenly becomes aggressive, take him to a veterinarian. Some medical conditions (e.g., hyperthyroidism) can make a cat irritable, leading to cranky behavior. Medication also can temporarily help a cat relax. If the cat gets a clean bill of health, then it’s time to become a pet detective to find the source of the cat’s stress. Watch your cat’s behavior, especially immediately before he becomes aggressive. Is he grumpy with everyone or one person? Is he chasing all kitties or only one? How is he displaying aggression? Is his tail fluffed like a bottle brush, indicating fear? Next, consider the environment. Has anything changed? Has someone moved out of your home? Have your work hours changed? Did you rearrange furniture or add a new sofa? Cats feel secure when they know their surroundings, so changes in the home can cause stress. If one cat is picking on another, put a bell on the aggressor’s collar to warn the other cat of his approach. If one cat is staring intently at another and getting ready to attack, toss something such as a pillow between the cats to break that stare. (Never place your hand between the cats in this situation!) Or, distract both cats by waving a feather toy on a stick between them so that the aggressive behavior may be channeled into play. If one cat does attempt to fight with another, separate them in different rooms for a brief time-out. If the behavior continues, isolate the attacking cat in a comfortable room for a few days. Then slowly reintroduce the two cats by first placing a baby gate at the door of the confined cat’s room to see how they react. If you’re playing with a cat and he nips at your hand, stop playing and give him time to calm down. Spending more time with a cantankerous cat also may help calm him. Also be sure to close those blinds so that your cat can’t see the teasing stray cat or bird outside. Another way to calm anxious cats is with Feliway®, a synthetic chemical product that mimics soothing cat pheromones. Humans can’t smell Feliway®, but cats can when it is sprayed onto a cat’s bed or used as a plug-in atomizer. Similarly, Bach Flower Remedies® are flower extracts that can calm agitated cats; simply place a few drops of Rescue® Remedy in the cat’s water bowl. All cats are different, so what works to calm one cat may not work for another. Sadly, there may be personality conflicts where two cats will never get along and will have to be permanently separated. But in many cases, if you have the patience to find and minimize the source of the cat’s stress, that cranky cat should soon return to being the sweetheart you adore. Animal Friends can help with other cat behavior concerns. Check out our cat classes in the enclosed Animal Friends University catalog, or call our Behavior Hotline at 412.847.7070. We have a 2yo female and 6mth old male. We got through weeks of introductions and they eventually settled and ok. Although the female often doesn't like kitten coming too close but they play fight etc. Just recently the cat had started hissing at the kitten again and really seems annoyed at the kitten. Not sure what's going on! Dont use the product that stops cats "spraying" if the cat is not using its litter box theres a reason. If you care about your cat at all you'll investigate why. it could be a territory thing, if you dont have any scratching posts around the house then your cat cant mark its territory this way and will find other methods to mark it territory (i.e spraying). Or maybe you can isnt using the litterbox because your not keeping it clean enough? or maybe you have put the litter box near your cats food? like any animal cats dont like to sh*t where they eat. as well as being predators cats are also prey animals so cats so they like to know they are safe and have an escape route, if you put your cats litter box facing a wall, have covered it or made it in anyway difficult for your cat to get in and out of not only the litterbox but that room, your cat won't want to use the box out of fear of being trapped. why do people think cats are so stupid? if your cat is showing behavioural problems its probably upset by something your doing. Be a good owner and take time to solve the issue and not just mask the symptom. Trap, Neuter and Return program has returned! Keep Your Pets Flea and Tick Free!